The Clinton River Mountain Bike Association’s (CRAMBA) National Mountain Bike Patrol group has had another very successful year in 2014. The mission of the CRAMBA Bike Patrol is to Assist, Educate and Inform mountain bikers and other trail users in safe, responsible and respectful use of bike trails and parks. This is accomplished through volunteers “patrolling” local trail systems. The CRAMBA Bike Patrol is not an enforcement agency, yet we educate users of proper “rules of the trail”. In CRAMBA Bike Patrol’s inaugural year, 2013 was a foundation building year. We started with 13 patrollers, 9 being brand new to the National Mountain Bike Patrol. In that year those 13 individuals accomplished more than 1000 hours of volunteer time patrolling our local parks. In 2014 we started off strong by hosting two new patroller orientations and training sessions. The training sessions included First Aid/CPR, trail etiquette, trailside maintenance, conflict resolution and Land Manager relations. These sessions quickly bolstered our ranks to 34 National Mountain Bike Patrollers for the CRAMBA Bike Patrol. Great community value was visible through multiple requests to have CRAMBA Bike Patrol at various events from 5k, Trail, and Half-marathon runs, Mountain Bike Races, large organized group rides and even Boy Scout den meetings. Financial support came from generous donations from Back to the Beach Races, Rochester Bike Shop, Tailwinds Racing, KLM Bike Shop, and Main Street Bike Shop. REI donated 14 First Aid kits to our new patrollers once again this year. CRAMBA patrollers put in an astounding 1733.95 hours of volunteer time in 2014. They also logged more than 8419 miles of trails patrolled. Log reports showed trail assistance provided anything from providing maps and directions all the way to life stabilizing efforts, 911 activation and patient transfer to local EMS. All of this is provided free of charge, by volunteers. The group is planning for training in the spring of 2015 to add to our wonderful group of volunteers. 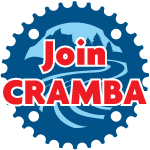 For information about requirements and basic program overview, please go to CRAMBA-IMBA’s Mountain Bike Patrol page. If you are interested in joining or have any questions, please send an email to bikepatrol@cramba.org. This is a great opportunity for you if like to ride and like to help others.